Radboud Recharge is Radboud University’s new platform for lifelong learning. On the platform you’ll find scientific stories and activities, tailored to your specific interest. From robotics and cyber security to philosophy and law: something for everyone. 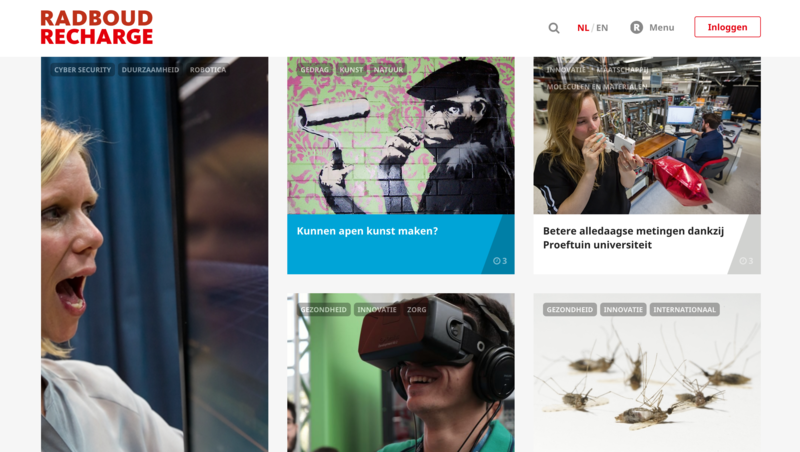 Radboud University in Nijmegen asked Total Design and Glow Communication to develop a service that keeps alumni and other interested parties informed of all publications. The university has many websites, each with it’s own articles and events. The best content appears on the Radboud Recharge platform. Visitors can choose topics and thus filter the content. The platform went live in January. Six months later, the collaborating parties present the second version, with an English version of the website. The platform is growing fast with 4,000 and 5,000 members after six months. The ultimate goal is to have 20,000 members by the end of this year.